Customers spend a lot of money in the name of love. Over the last year, there was a $1.6B increase in spending during Valentine’s Day. From jewelry and clothing to dinner and flowers, people are throwing out the big bucks for their significant others. Assuming you aren’t in the business of selling love, don’t let all the candy and flower talk deter you from getting in on the gift-giving action. More people are starting to celebrate the holiday with their friends, family and even pets (oh yes—they’re getting a big piece of the V-day pie, too). Last year, 54.9% of Americans celebrated Valentine’s Day, so it’s time to think outside of the (heart-shaped chocolate) box. Capturing customer attention without being disruptive is key for this heartfelt holiday. Since 34% of U.S. adults have “broken up” with a brand due to disruptive marketing, you’ll want to strive for authenticity in your digital marketing efforts. Let’s get into five ways you can reap the rewards of Valentine’s Day love without being disruptive. Have you ever noticed that every time there’s a big holiday, bloggers capitalize on it with a big round up of their favorite items? This is a great way for bloggers to curate the online shopping experience for their hard-won readers, since they know all the best gifts to buy (and their readers know it, too). Reach out to a blogger that hits your target customer, and get your product included in their already-existing roundup. Being included in a trusted blogger’s gift guide is key when customers are ready to shop for Valentine’s Day. After all, these influencers are viewed as one of the most trusted sources of information on the web and one of the most sought-after solutions for informing purchase decisions. 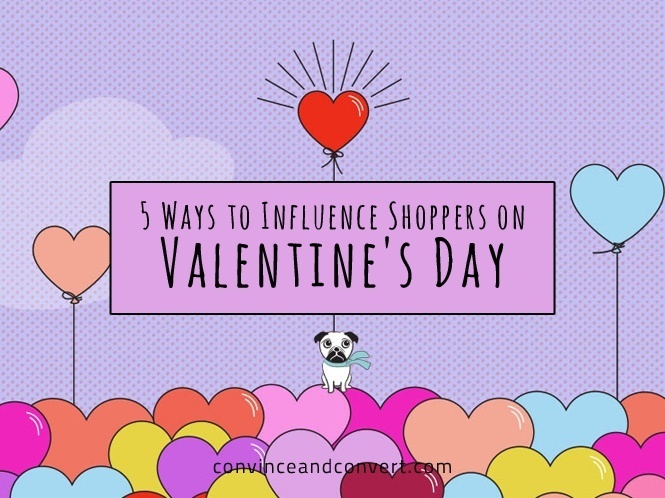 User-generated content (UGC) is one of the easiest and most inexpensive ways to experiment with influencer marketing during Valentine’s Day. Customers basically do the work for you by sharing the items they’ve purchased from you with their friends on social networks. 71% of consumers are likely to purchase an item based on social media referrals, so this is key. And since 25% of search engine results go to UGC, you should definitely let your customers and influencers help you become the content that shows up when people are searching for your type of product. When it comes to UGC on Instagram, clothing has the most impact on purchases at 6.4x, followed by jewelry at 2.4x, footwear at 1.7x, beauty at 1.6x, and consumer electronics at 1.6x. Many of these items are high on the V-day gift list for both men and women. Ask your customers to share their content through a branded hashtag, as this is low-hanging fruit for tracking your UGC. Include it in your Instagram posts and on your profile page, so followers see it right from the get-go when they visit your page. And if you’re working with influencers, ensure they’re using it, too. Pinterest is huge for Valentine’s Day gift inspiration. While this channel seems to be the most overlooked among marketers, Pinners love to buy. When it comes to influencing purchase decisions, Pinterest takes the cake with its visual content. Pinners love that they can save beautiful imagery to themed boards and go back later to pick the winning gifts. Not only is it visually appealing, but it’s also a productive way to bookmark items you need to buy. Since gift guides are huge for Valentine’s Day, enlist a set of Pinterest influencers to curate their favorite items from your brand onto their own Pinterest boards. Make sure those products are linked up to your product pages, too, for easy online research or “click to cart” action. YouTube videos are becoming a crucial part of the Valentine’s Day research process. In fact, 64% of people have said that the video site is the most influential channel for making shopping decisions. It’s also interesting to note that videos with the word “haul” in the title (the equivalent of telling your best friend about your latest purchase) have been viewed more than 1.1B times on YouTube. Shoppers turn to YouTube videos before they buy because it’s the best way to ensure they’re getting advice from real people with unbiased opinions. 68% of people prefer product videos from “people like me,” while 45% of people turn to experts. Whether you’re working with a well-known influencer or a magic middle blogger, you’ll have your bases covered. Get your product included in a “Haul” video, pronto! A lot of brands are iffy about jumping on the Snapchat bandwagon. If your customers are Millennials, though, Snapchat is absolutely where you need to be. And what better time to jazz up your social media presence than during the V-day celebrations? This channel has become a mainstay for young users between the ages of 18 and 34. Millennials and Gen Zs are much more interested in recommendations from their peers than generic branded content. The rules for Snapchat are still being written, so the key is just to have fun. Use the channel to share the realistic side of your brand. Leave your perfectly curated feeds for Instagram. Give viewers a time-sensitive offer they can’t resist to ensure you get them into your store, and leverage an influencer’s audience to get much more out of your campaign. Let the Valentine’s Day social promotions begin! And in the mean time, read on for more insights on the most heartfelt holiday of the year in this infographic by The Shelf.